What a fantastic weekend! The dance school had 15 numbers in their latest regional competition held in NYC – The total tally was 12 Firsts, two seconds, one third, Best Costume, Overall top score Large Group, First runner up high score small group and second high score runner up for Line. Fourteen dance schools gathered in Brooklyn for this regional competition. All of our dances were in one day which meant a very long day for the team. The first one kicked off at 08:15 and the last one went on at 21:15. I was exhausted by the end and all I did was take pictures of them, I can only imagine how they felt. Our daughter was in six of those dances including the first one and the last one but her adrenaline was still going at 23:30. Ah to be young again…. I was chided by my wife for not getting many pictures of our daughter during one particular dance but here’s the thing – when I am shooting them I do not look at who they are, I look at how they are. Body positions, expressions, groupings and lighting. There are those dancers though who always seem to be in my frame though and some who do not make it in. I try and spread the shots out to get everyone, but it is difficult at times isolating one person in a crowd of moving dancers. A shout out to the mom’s who help with the costume changes! Their day can be as stressful as the dancer’s. 1st place in category and winner of Best Costume. I shot a 135 mm prime lens for the majority of the day and I think I went more vertical than horizontal because I was close to the stage. I love that lens, It is fast, crisp and clean. I so desire the infamous 70-200 2.8 IS but a bit out of budget for me at the moment. I did alter my position in the room for a couple of the small groups and used a 200 mm prime but the light fall off was not too my liking so I reclaimed my spot against the wall, stage right within the first ten rows. I managed to get myself into the front row during the last two hours and used the 24-105 f4 for some wider takes. It has proven very difficult to chose a favorite picture from the weekend but this one is definitely in the running. Form, texture and emotion! And my slightly bohked out daughter in the background. This next dance screamed black and white so I tinkered with a black and white conversion in Lightroom. One of our new dancers made this shot rock! 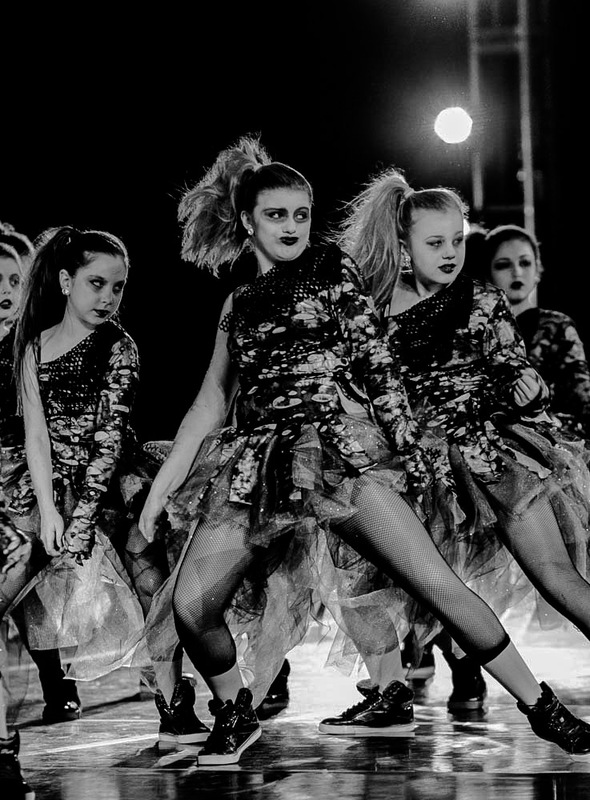 And I should include my daughter here too…Love the expressions…The dance is called Monsters. When we had a break of more than 90 minutes I cleared my card, putting the pictures on the laptop and external hard drive. Naturally once they go on a computer you want to see how they look, then you see some that you really like, then you edit those and of course once that is done might as well get them up for the parents and team to see. I was hoping this would generate some excitement for everyone. This is the first time I have turned around the shots that quick. I was also much more selective than last year in depressing the button so I did not take as many shots. I will admit that once I got home and viewed the posted ones on a desktop there are some that you can tell were quick edits on a small screen. I am currently going through everything on the desktop for full viewing pleasure. This shot is from the rear of the room with the 200. Not quite as clean as the ones from the front. This is one of my favorite dances and one of the ones I will be keying in on for our next competition. And another with the 200 from the first dance after I changed, looks like I was not dialed in quite yet. The shutter speed was too slow so we can see some motion blur here. While I love my prime lenses it does prove difficult to compose in tight quarters with action. A few shots I have were great except a hand would be missing, or the feet, but live and learn for every press of the shutter is a new learning experience for me and one that I can build on for the next time. This next dance the had the highest overall score for large groups, first place in its category and brought warmth to a cold and snowy day. It also had the judges overjoyed because the girls incorporated their props into their routine which apparently does not happen that often. This competition has the judges and the audience all on one level, the stage is elevated about three feet off the ground, so heads are always in the way and I am constantly cursing at them. This is also the reason I prefer to shoot at an angle at this venue and do my best to avoid said heads in the way. Much like any event you see a little bit of everything at these competitions – I will leave you with this…..
First I must preface this by saying…. It is not our dance….